Last year I read and loved Shirley Jackson’s gothic masterpiece We Have Always Lived in the Castle. 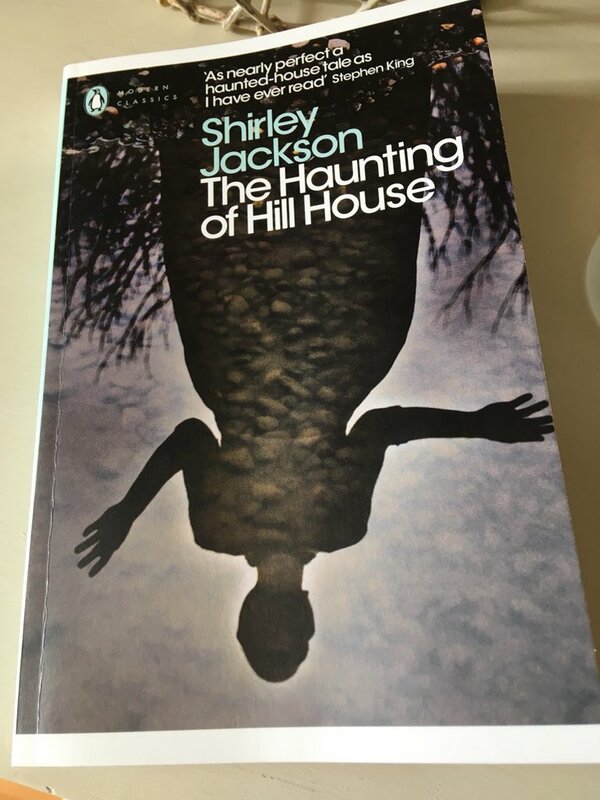 So, it was with a keen sense of anticipation that I picked up another of her classic novels, The Haunting of Hill House, first published in 1959 and famously adapted for the screen as The Haunting some four years later. It’s a brilliantly unsettling book, a gothic/psychological chiller that relies more on the characters’ fears, imaginations and terrors than any explicit elements of horror or violence. Central to the story is Eleanor Vance, a rather reclusive, childlike woman in her early thirties who travels to Hill House at the invitation of Dr Montague, an academic with an interest in the paranormal. Dr Montague has rented Hill House for the summer to observe and collect any evidence of supernatural activity or ghostly goings-on, not least of which may be connected to the dwelling’s complex and ill-fated history. Also joining Dr Montague and Eleanor at the house are Theodora, a bright, flamboyant young woman who brings a touch of sophistication to the proceedings and Luke Sanderson, the congenial heir to the estate. Eleanor is the first of the group to arrive at the property, and her initial impressions are not promising. Hill House itself is a strong force within the book, its imposing presence making itself felt at an early stage in the story. The house has been built in a curious design with the various rooms forming two concentric circles surrounding a central inner room. All the angles and doorways are slightly off-kilter, giving each room a somewhat unbalanced perspective, a feeling which only adds to the creepiness of the place – the internal doors seem to close of their own free will. The housekeeper, Mrs Dudley, is a very strange creature indeed, unwilling to waver from her strict timetable of breakfast at nine and the laying out of dinner at six sharp, leaving everything in readiness for the guests so that she can head off to her own home before it gets dark. Mrs D is a wonderful Jackson creation (albeit in miniature), delivering her lines in a deadpan style – all of which adds a touch of dark humour to the novel. In many ways, Eleanor acts as a focal point for the story. She has come to Hill House as a means of escape, to break free from her unhappy home life, an existence indelibly marked by the lonely years she previously spent nursing her sick mother (now deceased). There is an increasing sense, especially as novel progresses, that Eleanor sees Hill House as her destiny, drawn as she is to certain aspects of the house in spite of its chilling appearance and unsettling aura. At first, all seems relatively uneventful at the estate, and the members of the group sleep soundly through the night. However, it’s not long before the house begins to exert its mysterious forces on the group. A sequence of frightening noises, the appearance of strange writing on walls and other inexplicable events come together to unnerve the inhabitants, Eleanor in particular. In this scene, she cries out to Montague and Luke for assistance. As the novel moves forward, there is a sense that Hill House is taking control of Eleanor, possessing her in some way, with things coming to a head following the arrival of Dr Montague’s disagreeable and controlling wife and her rather blunt assistant, Arthur. Mrs Montague also has a keen interest in the supernatural, bringing with her a planchette – a sort of Ouija board that produces words – in the hope of being able to communicate with the spirits. The various relationships between women form an interesting thread which runs through the book, almost all of them characterised by hostility, envy or jealousy. First we have Eleanor and her sister – a woman we never meet in person, although we know that Eleanor dislikes her. Then there are the two Crain sisters, the daughters of the ill-fated man who commissioned the construction of Hill House in the first place – after inheriting the estate following their father’s death, the two sisters then spent a lifetime arguing over the division of the property and the family heirlooms. Finally, we have Eleanor and Theodora who initially form a close bond in unison against the potential terrors of the house. There is a sense that Eleanor views Theodora as the soulmate she has longed for, or even the person she would love to be herself – a glamorous, self-assured woman with an interesting life. But then the relationship between these two women begins to sour when Eleanor feels provoked by Theodora, a situation that only serves to distance Eleanor from the rest of the group. The way that Jackson illustrates the gradual falling apart of Eleanor’s mind is very effective, encouraging the reader to come to their own conclusions about the young woman’s sanity. Does the terrifying aura of Hill House have the greatest impact on Eleanor’s state of mind, or is she inherently emotionally unhinged anyway irrespective of her surroundings? There is a degree of ambiguity here for the reader to ponder. Eleanor is undoubtedly a daydreamer and fantasist, her vivid, childlike imagination running riot at various points in the story. When she spots a tiny cottage hidden away in a garden during the journey to Hill House, Eleanor imagines herself living there alone with only her fantasies and a white cat for company. Several of the motifs and images she creates at this point resurface later in the book, echoing and reverberating with great effect. These recurring symbols reminded quite strongly of Merricat’s lucky charms and rituals in We Have Always Lived in the Castle. All in all, this is an excellent novel – a very striking exploration of a character’s psyche. It’s extremely well-written, too – at times the prose has an almost musical quality. Fans of Castle will almost certainly enjoy Hill House, a book that turned out to be a very satisfying and intriguing read for me. It was one of Max’s summary posts that prompted me to bump it up the pile – you can find a more detailed review here. Ali has also written about this book here. The Haunting of Hill House is published by Penguin; personal copy. This entry was posted in Book Reviews, Jackson Shirley and tagged #ReadWomen, Book Review, Classics Club, Fiction, Gothic, Penguin Books, Shirley Jackson, US on June 12, 2018 by JacquiWine. It’s great isn’t it? A very nice review Jacqui, and you’re absolutely right I think to draw out the interplay between women in the novel and the ambiguity of Eleanor’s decline. Right from the start, before she even reaches Hill House, she’s a fantasist. So how much of what we experience through her is real and how much is what she brought with her? Thanks, Max. Yes, deliciously creepy. It feels like a classic Halloween read, just the thing for a dark night in front of a roaring fire. Instead of which I read it over a rather sunny week in May! Oh, well…it still had me gripped. That was the crux of the novel for me, the exploration of Eleanor’s state of mind. I think she was somewhat unhinged before her arrival at Hill House – the fantasies over the cottage illustrate that. Then again, the way Jackson plays with this theme once Eleanor reaches Hill House is very clever. I also think Jackson is particularly strong when it comes to capturing the relationships between women. It was was one of the things I loved about We Have Always Lived in the Castle – the bond between Merricat (the childlike narrator – an excellent one in this case) and her older sister, Constance. That’s not to say she can’t write men – she can, but her women seem more interesting to me. Oh, I meant to say that I thought a bit more about your reservations over the late introduction of Mrs Montague and Arthur and their impact on the mood/tone of the book. I can understand your reaction to that as it did dissipate the tension somewhat. That said, I was kind of okay with it as a bit of light relief, especially as both of those characters were so ridiculously funny. One of the things that really surprised me when I read Castle was Jackson’s use of dark humour – I simply hadn’t expected that at all. I don’t think I’d seen much about it in any of the reviews or recommendations. The humour came at a fairly early point in that book and was arguably more successful because of the positioning. Even so, I do think Jackson had a wonderful eye (and ear) for a comic situation – some of her observations are spot on. It’s very funny in places isn’t it? I loved the repetition of the housekeeper’s warning, a bit over the top the first time and plainly ludicrous the second. Oh my god, Mrs Dudley! She totally cracked me up. I could just imagine her trotting out those sentences like the prophet of doom. Apologies if you’ve already touched on this, but have you seen the film of this, The Haunting? I think I may have watched it many moons ago, but I can’t be sure. Shirley Jackson is SUCH a strong writer. I am so looking forward to the recognition of her genius as a great novelist, along with other underrated women of the 20th Century including Penelope Fitzgerald, Elizabeth Taylor, Jean Rhys, Barbara Pym and so many more! A big fat ‘yes’ to that. You’ve listed most of my favourite ladies there, I love them all. In fact, I’m tempted to add Muriel Spark to that list, especially given her talent for the darkly comic. I haven’t always got on with her in the past, but I’m slowly starting to come round to her charms. Brilliantly unsettling is exactly right you can’t help but read it with a slight shudder. Mrs Dudley is such a good Jackson character. Absolutely. It has the potential to scare the hell out of you even though nothing much in the way of explicit horror or violence actually happens. I loved Mrs Dudley and her deadpan approach to everything. She’s a classic character. Excellent review, Jacqui, Which of the two books did you think was best? I have both (gifted, very kindly to me) and I’m planning to readalong one of them with a friend later this month. Which would you recommend? Ooh, they’re both excellent, so it might depend on which one takes your fancy at the time. If I had to call it, I’d say We Have Always Lived in the Castle as the narrator, Merricat, is so engaging and distinctive. Let me know how you get on – I’d love to hear. Thanks Jacqui :) it’s reassuring to know they are both great reads. One of my students wrote about We Have Always Lived in the Castle this year and made it sound very interesting, and I have read a lot of praise of this. Have you read any of her short stories? She’s great – definitely a writer I’m glad to have discovered. I haven’t dabbled with her short stories yet, only the two novels. That said, I do have a collection of her stories (Dark Tales?) on the shelves, so maybe later this year depending on how things go over the next few months. I don’t think I’m in a position to plan ahead at the moment! It’s amazing that she was able to write a haunted house story in the ’50s and avoid too many clichés. I remember the bit when they go into the grounds of the house during dayliht and Jackson still manages to make it creepy. I’d thoroughly recommend Hangsaman. Yes. totally. I was expecting some of the usual tropes to come out, but instead she managed to keep it relatively fresh and surprising. I actually found that daytime scene one of most disturbing in the book. The way she maintained the suspense was very effective. Thanks for recommending Hangsaman. I shall have to take a look at that. Very interesting review, Jacqui. It sounds excellent. And I think I’ve got it on my piles. I have still not read her and thus might be a great start. Thanks, Caroline. Jackson’s great – and I think you’d find the psychological aspects very interesting here. It’s more about Eleanor’s state of mind than jump scares (or any other explicit elements of horror for that matter). One or two of the scenes — e.g. Eleanor’s fantasies when she spots the secluded cottage — reminded me a little of some of Angela Carter’s work. I’d be interested to hear your thoughts on that whenever you get an opportunity to read it. I always thought it had something in common with Henry James’ The Turn of the Screw. Yes, definitely. It reminded me a little of the film The Innocents, which was based on that very book. The tone/mood felt quite similar. Oh, it’s so worth it. I doubt you’ll be disappointed. You know I can’t actually recall if I’ve ever seen The Haunting! I may have many moons ago. Either way, it’s certainly on my list of films to watch in the not too distant future. I’ve seen two film versions. One, in black and white, was very good. The other, modern and just a few years back, is a terrible CGIfest which misses everything good about the book and adds nothing in its place. The Hollywood version sounds like a bit of a dog’s dinner. Apparently there’s a Netflix series on the way. I’m not sure how I feel about that – a tad worried I suspect. Great review as always. This book has been on my radar for years. The way that Eleanor’s psychology is laid out and as it relates to her environment sounds brilliant. I am also a big fan of the film The Haunting. I would definitely recommend it, especially if you’re a fan of The Haunting. The way that Jackson portrays the gradual unravelling of Eleanor’s mind is very effective (I think you would find the psychology really interesting). It’s certainly one of most unsettling pieces of fiction I’ve read in recent years.